OK, so it's not quite cake - but it certainly looks like it, right? 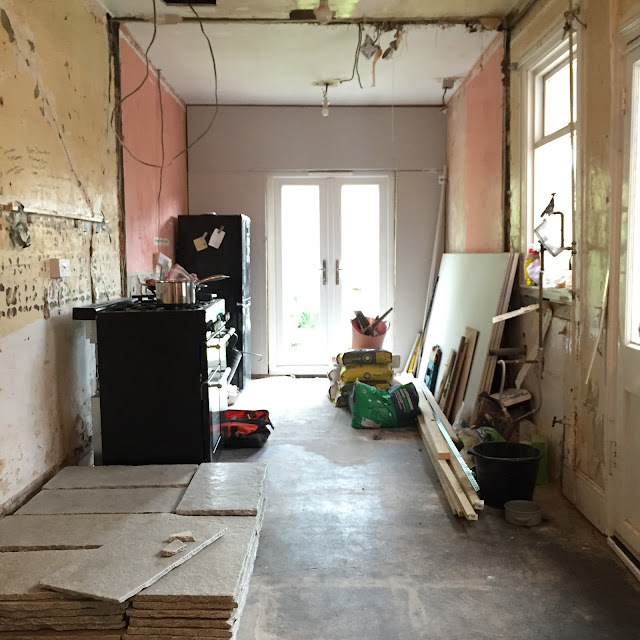 When we were planning the walls to be knocked through into the kitchen, a number of tradespeople suggested to us that we spent a little extra cash insulating some of our walls. Houses are typically built with two-brick thick walls and nowadays new houses also have a cavity between these bricks filled with insulation. This keeps you nice and toasty in winter. But in our house, some of our walls are just one brick thick which means they transfer the cold from the outside into the house very very easily. Our solution? Cake. 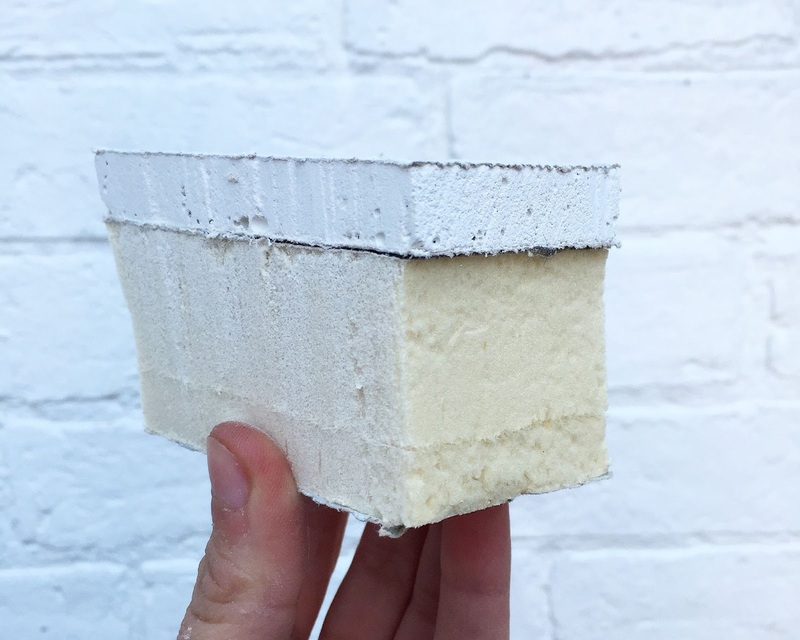 A slice of cake and a cup of tea solves many problems, but this cake lookalike is kind is actually an insulating plasterboard. The thinnest layer on the top is just standard plasterboard and the cakey sponge part is the insulation. 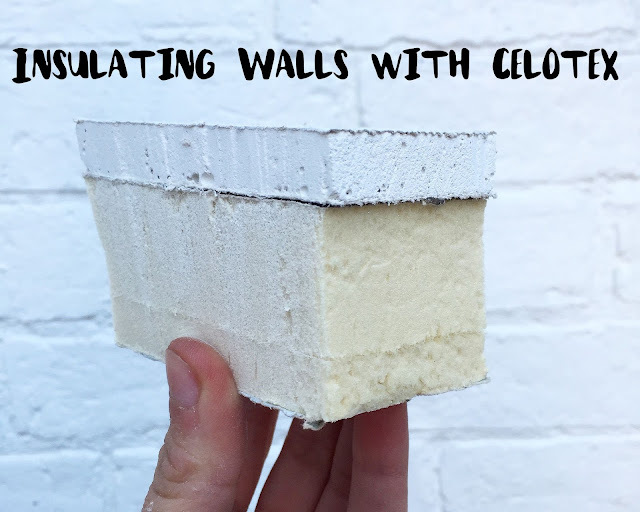 If you've ever searched out insulation before you've probably come across celotex insulation boards - they're a rigid board made from a foam-like material which makes them brilliant for fitting in-between joists of a floor or roof rafters in a loft where they can be cut to fit snugly enough to hold themselves in place. They're also a better insulator than wool insulation equivalents. This insulating plasterboard is the exact same stuff (also made by celotex), it just very handily has some plasterboard attached to it. It affixes on-top of existing walls and is the perfect solution for insulating walls from the inside without having to use too many materials or create too many layers. It's not a cheap product to buy and the thickness of this product means it does eat up some internal space, but I think the benefits far outweigh a few lost centimetres. Luckily for us, we're not too short on space in this house anyway! We've opted for a 5cm thick board (purchased from Insulation4less.co.uk) which we felt was a good thickness of insulation without being a bit overkill (you can get much thicker boards). So, where are we using it? Well I've mentioned previously that our conservatory is basically unusable in winter due to its thin polycarbonate roof (now fitted with a thicker more insulated version) and it's super thin single brick walls. We don't expect this insulating board to suddenly make it a hub of warmth in the winter, but if we can make it just a little bit more insulated we'll lose less heat through the kitchen and dining room which have single glazed windows looking into this room. We're also using it in the kitchen along the back wall (where we've recently fitted a new french door) as this is also a cold spot of the kitchen, again with a single brick wall. When this was a shower room, it actually used to feel like an outbuilding, although this may have been partly from the terrible fitting of old uPVC window! When this room is heated in winter we don't want to have any warm air drawn to this wall, where condensation could form and create no end of issues. It was bad enough having a hot shower in this room, so we're well aware this cold wall causes issues. 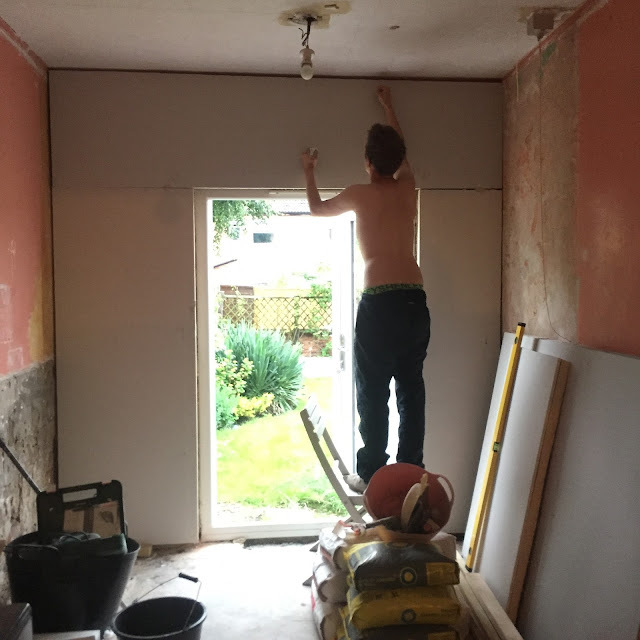 As for installing this insulating plasterboard, the best thing about this product is that it really is just as simple as installing regular plasterboard. You can fit using battens and screws or you fit via 'dot and dab' - there's no special materials or techniques required! And of course, as per usual we'll be fitting these boards ourselves. So, here's a quick look at the conservatory wall prior to insulating. I've mentioned previously how we were quite keen to cover up these bricks anyway as we felt there was a little too much exposed brick going on in this room and we intend on having a bit of feature wall instead. The conservatory is an 80s addition to the house, so the bricks really have no character and I wont be missing them at all! (If you want to read about the rest of our plans for this room, be sure to check out this post). We'll be fitting the boards via 'dot and dab' which we think is the quickest and easiest way to fit plasterboard. We applied some diluted PVA mix (50% PVA, 50% water) to the wall first to improve adhesion to the wall - this insulating plasterboard is much heavier than standard plasterboard so it really does need a good sticking base - this means no dust too! We then mixed up some plasterboard adhesive and dabbed blobs throughly around the edges where the board will be fitted and then around 30cm apart in the middle. The blobs of adhesive need to be consistently the same size to ensure when you press the plasterboard on it's stuck at every point and not just on one giant blob in the middle. We used a spirit level to make sure the board was completely level and then pressed the board hard into position to ensure complete contact with each blob of adhesive. A few hits with the spirit level helps greatly! Since it's heavy stuff you'll notice we did cut it down into smaller pieces as well, which we found cut best with a regular hand saw. The top of the wall was particularly tricky to plasterboard as we had to cut around the roof beams which took a bit of patience and thorough measuring, but any very small gaps that were just too small to fit plasterboard into, we simply filled with plasterboard adhesive so that when it comes to plastering there's no hollow spaces. And it's literally as simple as that! We used the exact same technique in the kitchen too. These walls were not only pretty horrendous in colour (erm, baby poop?!) but they were pretty awful in build quality as well. Falling plaster, cracked walls, flaky paint, you name it - so I was more than glad to see the back of these walls with some quick fix plaster boarding! We also had to accommodate for the new lintel over the door which protrudes out from the wall. If we had been simply skimming this wall without the additional insulating plasterboard this would have actually been a real issue, but luckily since this plasterboard is so damn thick, we simply notched out a section of the insulation to snugly recess the beam into it. Some more PVA and bit of dot and dabbing later and we were done! We finished the recess of the door with regular (non insulating) plasterboard and angle beads ready for plaster. It's hard to say how much of an improvement this stuff has made to the warmth of our home as it's currently still quite warm in weather and there's other factors we've improved in terms of insulating our home as well. But, I have no doubt these boards will be worth their money by keeping heat in, allowing rooms to heat faster and preventing warm air being drawn to cold spots and forming condensation. The obvious way to tell that it's already a benefit is that the wall is physically no longer cold to touch. The kitchen is already an improvement (goodbye baby poop walls!) and the conservatory looks a little more room-like too! I have no doubt we'll be using some celotex insulation again elsewhere in the house. It's a damn sight nicer to work with than pesky fibreglass! Have you ever used insulating plasterboard? Are you considering celotex insulation in your home?! First of all - I love your blog SO much! Thank you so much for putting the time and effort into it. As someone who is just in the process of buying their first home, (also victorian), its really a god send. I initially researched on google something along the lines of 'Removing gas fire DIY' (to see how to stabilise the chimney breast / seal it off safely once the gas part has been safely removed etc), and after a bit of scrolling your blogpost popped up, and i've been glued to your DIY posts ever since! It's so useful (and interesting!) for people like myself and my partner, who have absolutely no idea where to start but are looking to do the majority of work ourselves, your breakdowns are great too with prices which helps massively as I'm sure you can understand as a first time buyer (or even second time in your case!) money is tight. Also to consider when /where things may go wrong. A quick question about this post - after you had finished this insulating part on your walls, once all the adhesive etc had dried, would you then just apply the plaster straight ontop of this or have something inbetween? Ie another layer of plasterboard along the whole of the walls? I'm so glad the price breakdowns are helpful as well - Money is often considered a bit of a private subject, but I feel like in a renovation, these things need to be discussed so others know what to plan for and just whether or not they're being ripped off or not! And I can totally relate to money being tight as well, even on a second renovation! As for the insulating plasterboard - as long as it has the plasterboard layer already attached (like ours! they also sell it without the plasterboard layer), then you can plaster straight on-top of it - you don't need any other layer. We've already plastered over ours - it's exactly like plastering regular plasterboard!